Unfortunately it doesn’t look like we have any chalets here at the moment, but if you want to enjoy the thrill of the 4 Valleys then feel free to have a look at the chalets we have on offer nearby in Verbier and Nendaz. Verbier is perfect for adults who like serious skiing and a good nightlife, while Nendaz ticks all the boxes for families. 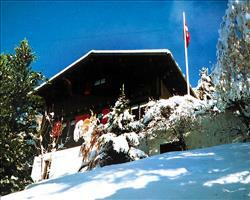 Staying in a chalet is probably the most relaxing way to enjoy the traditional ski experience. Nothing beats returning from a long day skiing to a cosy, authentic log chalet with a roaring fire and a hot drink being pressed into your hand by your chalet host. All chalets are catered which usually means breakfast, afternoon tea and cakes and an evening meal (including wine). Some chalets even feature hot tubs and saunas – the true way to unwind after a hard day’s skiing in luxury! If travelling as a large group, you can book out a chalet and have sole occupancy, or for smaller parties you are able to share with others and compare your stories of racing down the Piste de l’Ours. Chalets also offer flexibility in terms of travel, as they can be booked as part of a flights and transfer package, or simply on their own if you wish to organise your own independent travel.